*I use a size K (6.50 MM) hook and Red Hear Super Saver Yarn. *Please remember not to leave your pet unattended wearing things that might get caught on something and cause them to choke, or get stuck and be bored until you rescue them. Rnd 1: Ch 40, Jn with a sl st in first ch. Ch 1, * (sc, dc) in next ch, sk next ch. Repeat from * around. Jn with sl st in first sc. Rnd 2: Ch 1, (sc, dc) in same sc stitch as join. *Sk next st, (sc, dc) in next sc stitch. Repeat from * around. Jn with a sl st in first sc. Border for side one: If changing colors, fasten off and Jn new color with a sl st in same sc st as join, ch 1. Working in back loops only, (sl st, ch 1) around. Jn with a sl st in first st. Fasten off and weave in ends. Rnd 3: Flip cowl to work in the original chain row. Jn main cowl color (same color as Rnd 1) with a sl st in one of the skipped chains from Rnd 1. Ch 1, (sc, dc) in same chain as join. *Sk next chain, (sc, dc) in next ch. Repeat from * around. Jn with a sl st in first sc. Fasten off and weave in ends. Repeat the border for side one in Rnd 3. Row 1: Ch 10, (sc, dc) in 2nd ch from hook. *Sk next ch, (sc,dc) in next ch. Repeat from * to end of row. Row 2: Ch 2, sl st in the original chain row and pivot the work so that you are now working in the opposite direction. Ch 1, (sc, dc) in same ch, *sk next ch, (sc, dc) in next ch. Repeat from * to end of row. Row 3-9: Ch 1, turn, (sc, dc) in next st, *sk next st, (sc, dc) in next st. Repeat from * to end of row. 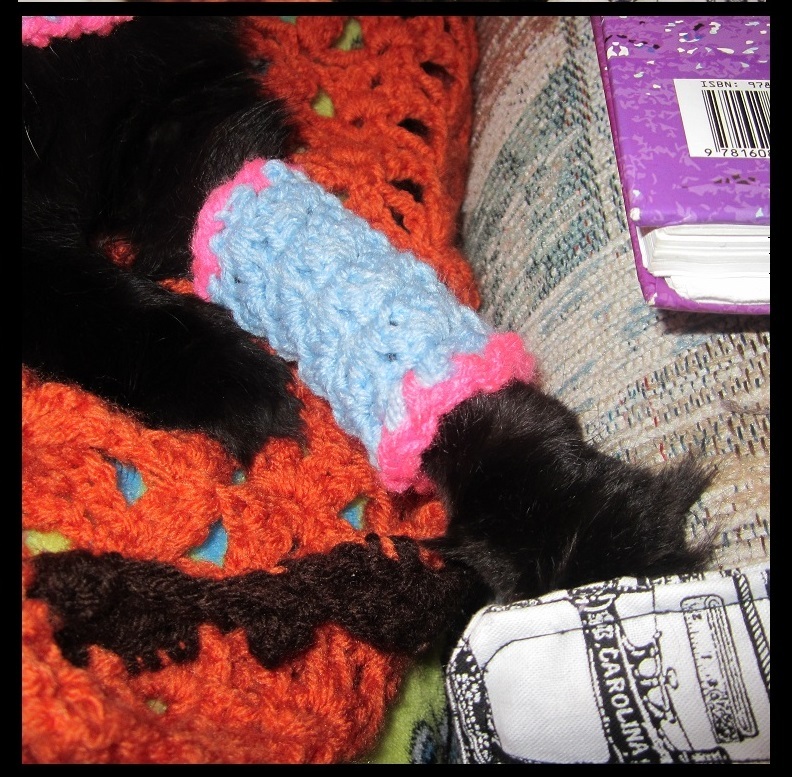 Fasten off at the end of row 9 leaving tail long enough to sew legwarmer together along sides. Weave in ends. For top and bottom border, jn with sl st, (ch 1, sl st) evenly around. Jn in first st with a sl st. Fasten off and weave in ends. 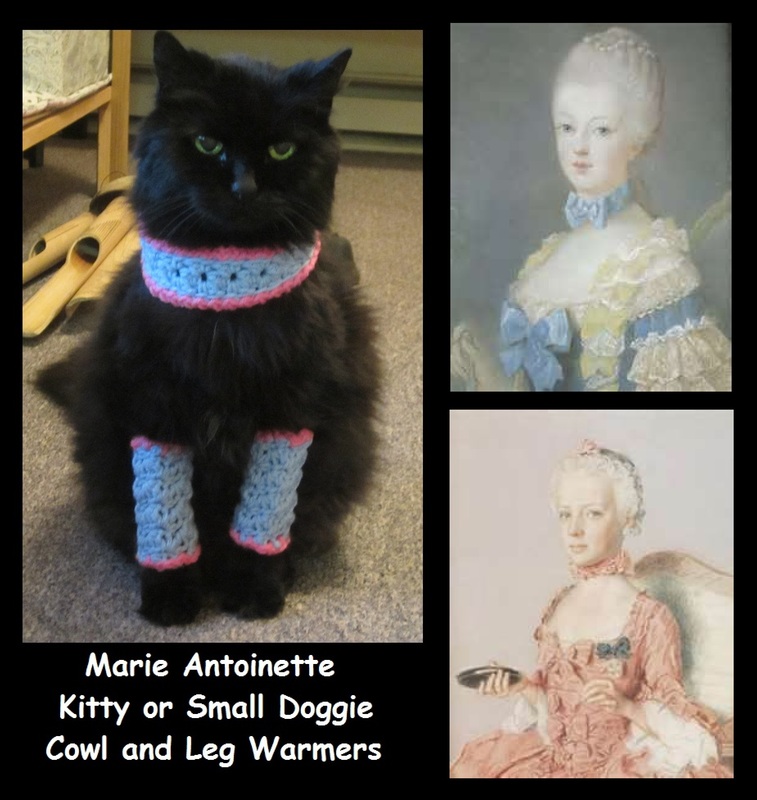 This entry was posted in Uncategorized and tagged accessories, cat, clothing, cowl, crochet, dog, doggy, free, free crochet pattern, kitty, leg warmers, leggings, leggins, Marie Antoinette, pattern, pet, pets, scarf. Bookmark the permalink. Thank you for this pattern! 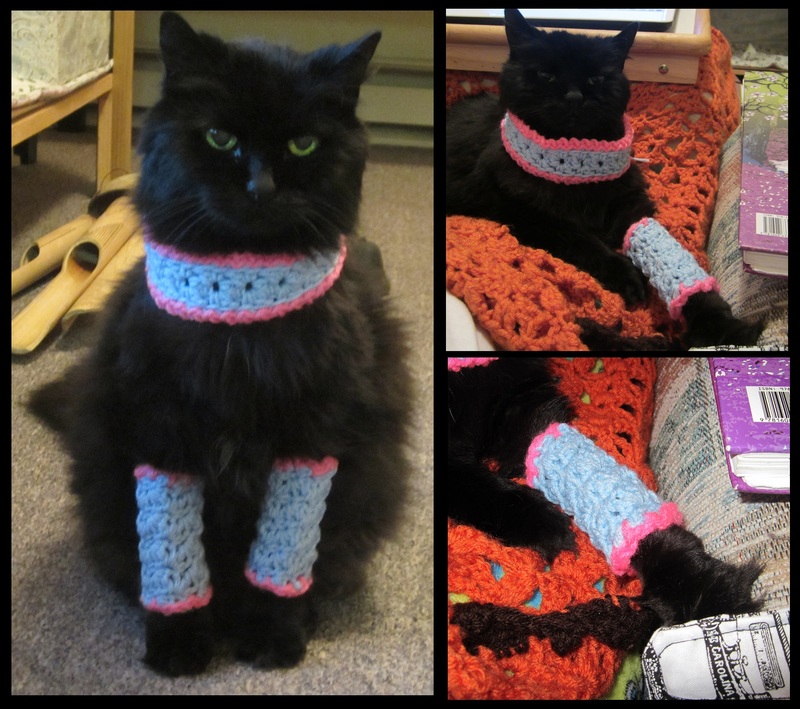 I have been looking for this very thing for my two cats forever…everything is for dogs! I am going to use Gumdrop by Red Heart in Grape and Smoothie, leftovers from grandchildren! Thanks again! Those sound like really pretty colors! 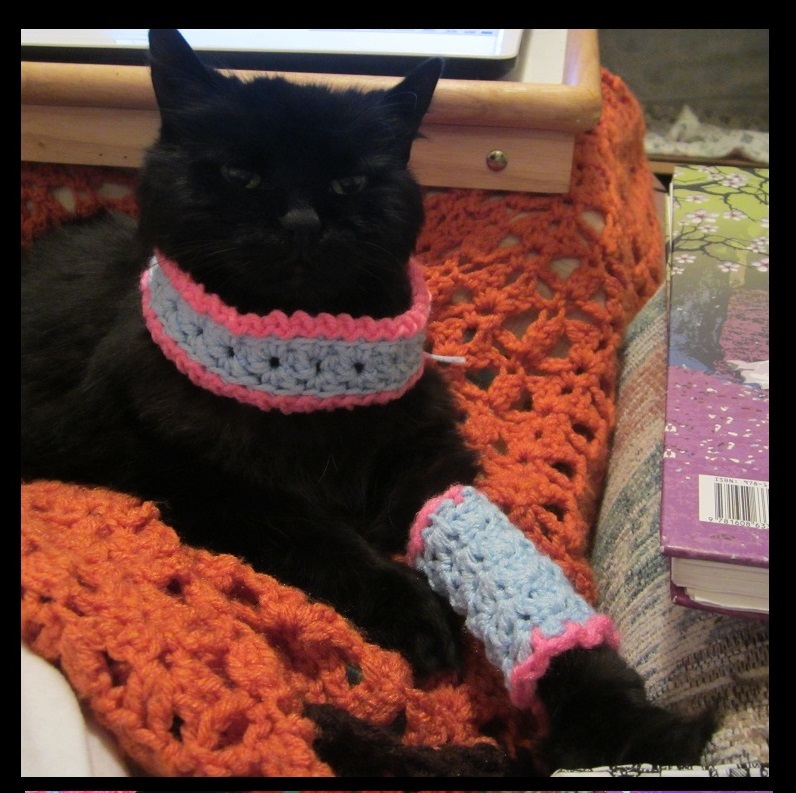 I bet your kitties are going to be super cute!! !